Hope you're all having a great day - it's Sunday as I'm writing this so I'm just having another nice lazy day in bed, but this post has been scheduled for Wednesday (because of me being busy with college and all that) so I hope your Wednesday is going well! Anyway, today's post is one I've been meaning to do for a while, and it's basically what I did to achieve my ombre hair, how I look after it, and my general hair-care routine. 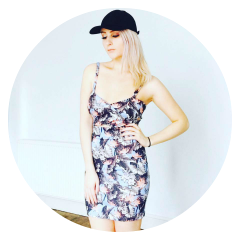 Ombre hair has been everywhere recently, and as far as I'm aware, it's still highly in trend! I think one of the many great things about this look is that not only are there a huge range of shades on the colour spectrum to which you can customise your ombre (black to brunette, black to blonde, brunette to a lighter shade of brown, brunette to blonde etc) there's also no hassle and no need to top up your roots - ombre hair is a gradual shade of lighter colour towards the bottom, so the upkeep is simple and so easy to acheive! 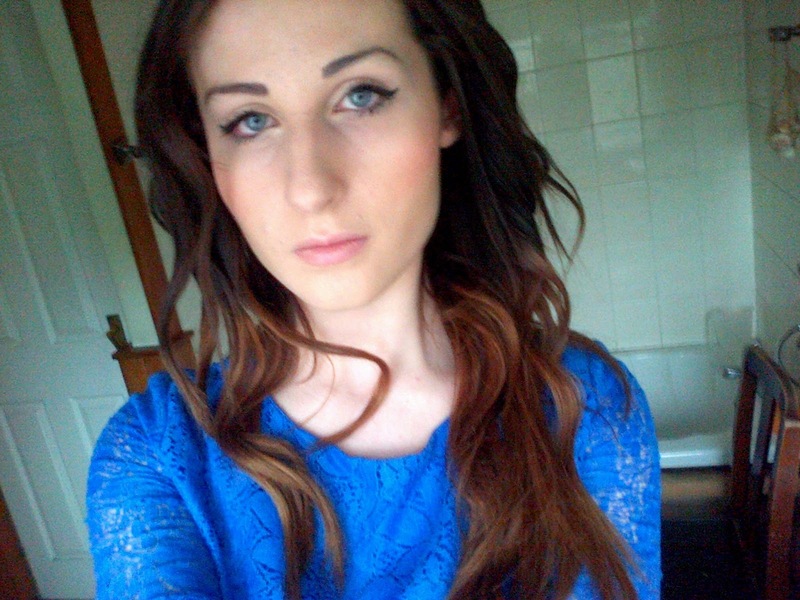 So, here are the steps I took to get my hair ombre - and how I look after it too! To get my dose of ombre, I used L'Oreal Preference Wild Ombre in No1, starting from my chin all the way down to the tips (according to the instructions, if you have un-layered, long hair, this is where it should begin!). It comes with a brush that's supposed to make it easier to apply, but my friend who dyed my hair for me said she found it easier without it - though this could be due to my thick hair! It also recommends leaving on the hair for 25 minutes, but for a deeper, lighter colour, we left mine on a little longer, and I'm pretty glad I did. Even though it was on a long time, it still came out looking pretty gingery afterwards! Now, let me just say that I'm well aware I have split ends - I've had them for ages! Obviously the bleach in this product hasn't helped that, and after I used this dye the ends of my hair were pretty dry for a while, but after using intensive conditioners on my hair twice a week since, it's pretty much back to normal! I do plan on going to the next stage with my ombre soon and dying the ends a lighter blonde, but have refrained for a while due to the whole damaging thing. I've also hesitated from having my hair trimmed as well as I've wanted to get it the longest length possible first, but it's obviously needed now, and I will definitely be getting at least an inch off before I put any more bleach in! 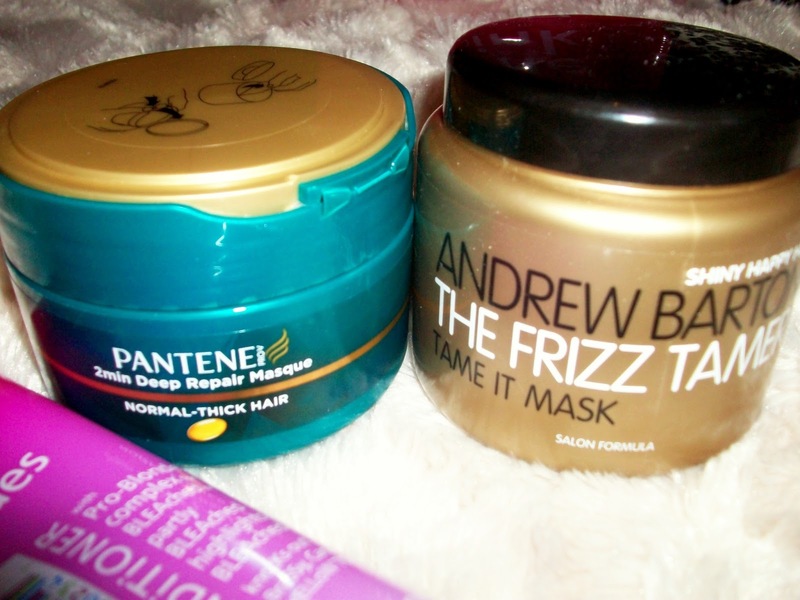 So, if you plan to do the same with your hair, I recommend implementing an intensive conditioner into your hair wash routine - I switch between Andrew Barton's 'Frizz Tamer' Mask and Pantene's 2min Deep Repair Masque for normal-thick hair. I received the Pantene deep repair masque as a Christmas gift along with the shampoo and conditioner from the same range, and the frizz tamer was a birthday present - I have to say, though, I really like the frizz tamer, possibly more than Pantene - it's not specifically for damaged hair, more useful for hair prone to frizz, but as mine is naturally frizzy, it really works well and makes my hair feel lovely and soft! Shampoo: For my shampooing, I mainly just use the Pantene Pro-V Repair & Protect Shampoo (from the same range) and massage into my roots ONLY. Shampooing can be quite drying to the hair, so it's only really needed at the top - and spending a minute or two massaging your scalp can help promote hair growth! 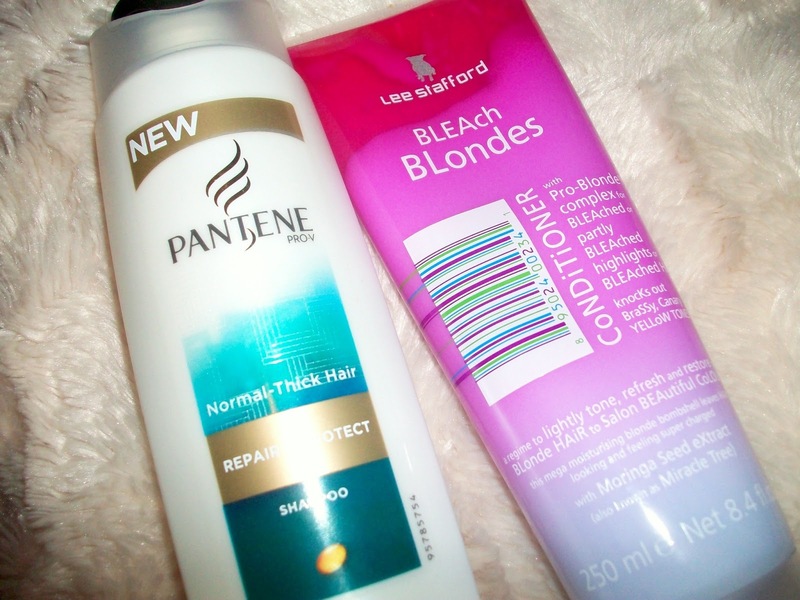 Conditioner: For my conditioning, I bought the Lee Stafford Bleach Blondes Conditioner after reading a product review on the same L'Oreal hair dye I used - the reviewer wrote that this was a good product for washing out gingery tones, and it really works well - mine's nowhere near as ginger as it was when it was freshly done! It's supposed to 'knock out brassy, canary, yellow tones' and lightly tone bleached hair, and I simply apply this to the ends and where the ombre is - not needed anywhere else! 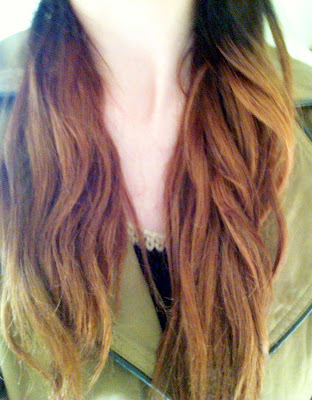 Before I apply any heat to my hair with straighteners(once it's dried naturally!) I always apply heat protecting products - I first use L'Oreal Paris Studio Silk&Gloss Hot Straight Cream, and as the bottle says, it gives a 'glossy shine, silky touch'. 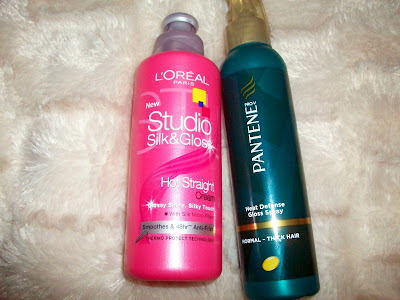 It's great for making your hair look shinier and healthier, and smells amazing too! i wouldn't use too much, though, as it could end up greasy if you slap on half the bottle! I then spray a little Pantene Pro-V Heat Defense Gloss Spray for Normal-Thick Hair all over my hair again, from roots to tips, and this is also great at protecting the hair, giving a lovely shine, and smells lovely too. Not too sticky either! And that's pretty much all there is to it! I love how the ombre looks so far, and I'm really excited to try the blonde ombre next. Inspired yet? Check out these gorgeous ombre hair pins! What do you think of the ombre look? Let me know in the comments! If you'd like to see my newest shade of blonde ombre and how I did it, click here. Thanks so much lovely! The blue lace thing is a dress actually, I should put pictures up of it sometime haha, but thank you!! I'll check out your new post dear :-) hope you've had a lovely day too! Well then, I cant wait till you will post, I wanna see the body of that pretty dress..Thanks my darling for stopping by as always.. speaks later Emily kisses. I am nominating you be the liebster award thats up on my blog. Use the same questions that I answered and just post it up on your blog linking it back to my blog as well. You're so welcome! Of course, I'll take some pictures and put some up this week for you! Ahhh thank you so much!! That means a lot to me! I shall do, hope you've had a great day too! Sounds fantastic sweetie. I'll be waiting for. smiling at you and hugs. Thanks for commenting and hope you've had a lovely day! Wow! Your hair looks fabulous! It doesn't look like it has any damage on it. Your ombre hair looks nice too! :) I just wish that you'll color it with a lighter shade of brown. Aww thank you so much lovely! Really?! Haha, I thought you could see the damage from a mile off! Mind, i've had my split ends trimmed since this photo so it probably looks a lot better now! Do you mean the shade on top a lighter brown or the ombre a lighter brown? 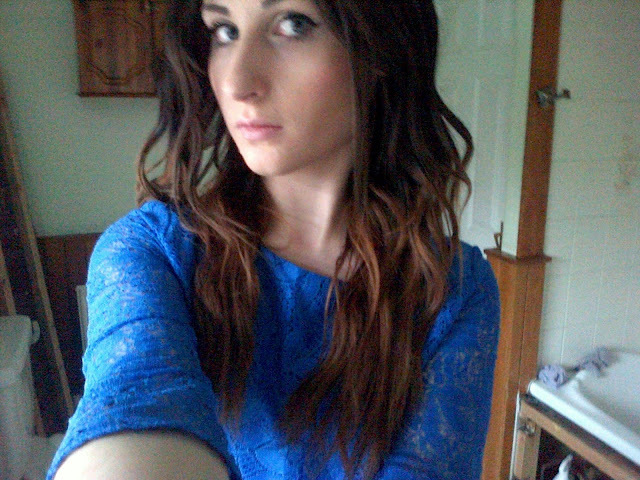 I kinda like the brown on the top either way - it's my natural colour so not too dark or light! 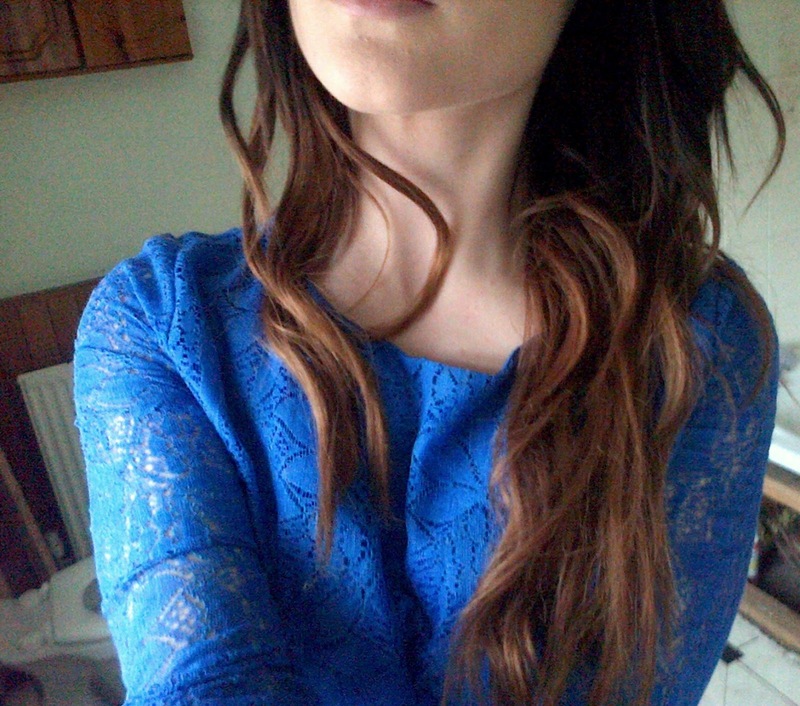 Hi Emily, You look amazing with such a nice ombre hair style and in your blue top. Thanks for sharing your hair care tips with us. have a lovely day dear !!!!!! Thanks for stopping by and hope you have a lovely day too!